Did everyone have a fabulous Christmas? We sure did. Our son and family was visiting and the house was filled with little ones laughing, screaming, crying, arguing and playing like all little ones do. Now they are back home and our house is quiet. It would have been a boring Christmas without them. We had a wonderful Christmas eve get together at my sister's, minus my brother and his wife due to the flu, and her house was beyond gorgeous in all its Christmas glory. Her pictures on her blog do not do it justice. Next week since it will be New Year's I would love for you to share your best project or projects(up to three) of 2012. Of course you can share some this week, too. Being super busy, like many of you, the last several days I have not had time to choose features this week, but here are some of the most visited links by y'all. Wonderful cozy bedroom ready for the holidays in plaids and toile by Opulent Cottage. SouthernAbbey shared her pretty dining room. 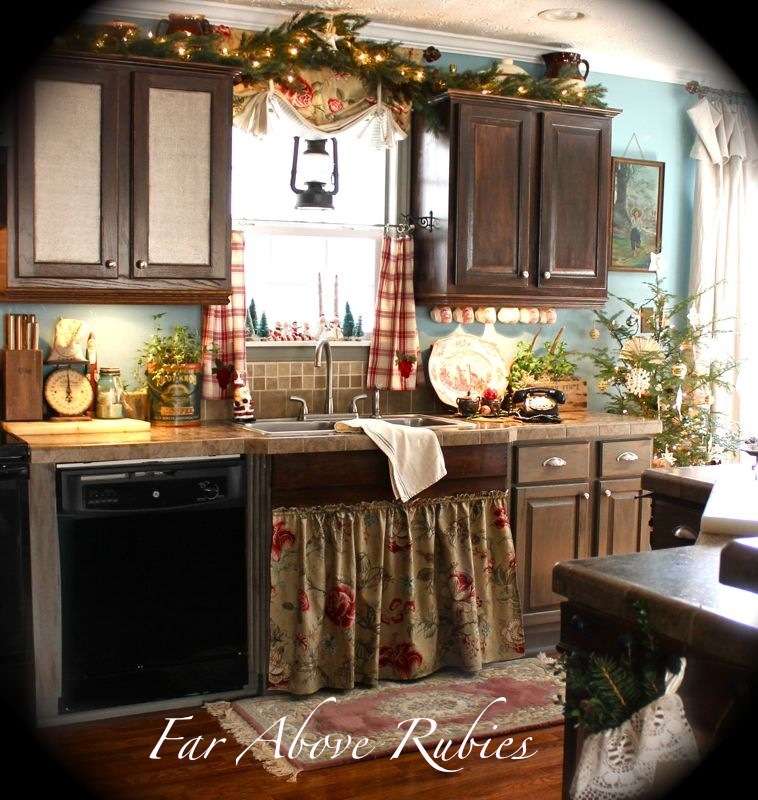 Love this cute cottage kitchen by Far Above Rubies. Y'all enjoyed Aimee's holiday home tour at It's Overflowing. Repurposed tree was shared by Number Fifty-Three. Love how she hung silver on it. 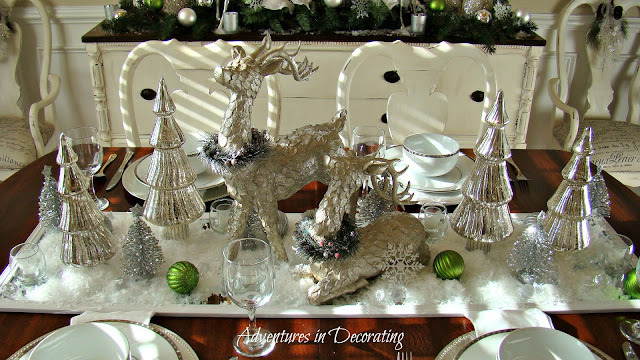 Adventures in Decorating shared this gorgeous winter wonderland dining room. Y'all were into the dining rooms. Here is another gorgeous one by Top This Top That. Designs by Pinky shared her new home all decked out. 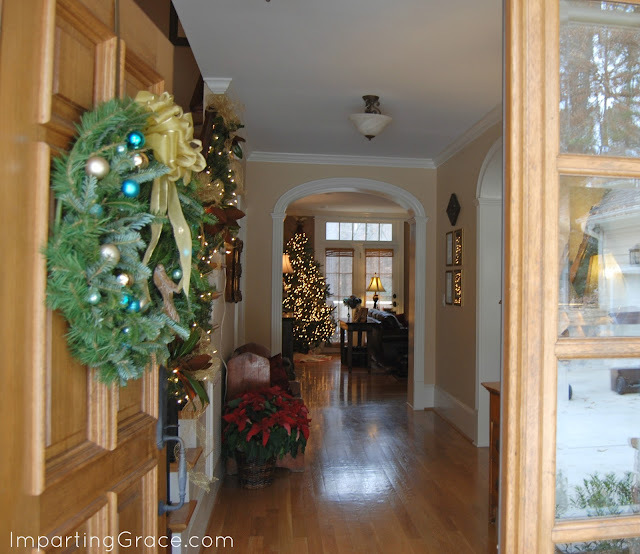 Another stunning home tour shared by Imparting Grace. If you were featured you can grab a featured button from my sidebar. Inspiring features Kim! Wishing you a Merry Christmas week and Happy New Year! Definite features with WOW, Kim! Thanks for hosting Wow Us Wednesday. Great inspiration. I saw your post yesterday too...your grand-kids are all so cute!! I had a great Christmas too! Santa was very generous this year. I love the featured cottage kitchen above. Thanks for hosting! Sounds like you had a wonderful Christmas! Thanks for hosting, Kim. Lovely features, darling kitchen. Thank you for hosting and I hope you had a wonderful C'mas too. I just posted our C'mas at my daughter's for the party. Thanks for hosting Kim! Glad you had a wonderful Christmas, we did too but today I'm pooped LOL! Thanks for hosting! Hope you had a Merry Christmas! Thank you for hosting this lovely party. Have a great week! It sounds like you had a fantastic Christmas! Thanks so much for featuring my repurposed tree. It was a great surprise this morning! Loved the family photos! Sorry to hear they were under the weather, so were we, but it was nice to have a quiet day together. Thanks for featuring my bedroom! I love it so much that I don't want to put it all away. It might still be Christmas in July here, haha! Those were some beautiful features! Sounds like your Christmas was perfect Kim! you're early today- u party animal! Well this was my official LAST Christmas link up for the year! Thanks for sharing my dining room! Thanks for hosting Kim. Time to get back to our normal routines. Thanks so much for hosting! Glad you had such a great Christmas! Happy to hear your Christmas was a happy one - saw yesterdays post - your grandkids are gorgeous! Kim glad you had a wonderful Christmas! I can't believe it is over already!Thank you for hosting! Thanks for the nice compliment! I really enjoyed having everyone over. It was nice to sleep late this mornng after getting up soooo early yesterday and going to bed sooo late! LOL! I think I'm still recovering from 3 days in a row of festivities. We gave Max a football for Christmas and he has been driving us crazy with rolling it ALL over (what used to be) my clean floors! Help me!! I'm sure you're busy getting your house back together too. Love those features you selected too. Hi Kim! I am glad you had a wonderful Christmas! I want to share the very easy and kids friendly recipe of our favorite Snowball Christmas Cookies. Thank you fro having me! Have a Happy & Prosperous New Year! Thank you for hosting! Wow, Kim, thanks for the feature!! Merry Christmas to you! Hope you had a nice holiday with your family. Oh, Kim your features are awesome! Everyone is just so amazingly talented! I am glad you had a wonderful Christmas. We sure did, too. Please enjoy the remainder of 2012, and good health and happiness be yours in the coming New Year. So glad you had a great Christmas, Kim. Thanks for hosting. What fun to see our Christmas dining room table centerpiece, Kim ... thank you for sharing (especially since it's now the landing pad for allll of my Christmas decor before it gets packed away for another year)! I love the other posts ... I'll soon be missing everyone's beautiful Christmas decor! Happy New Year, friend! Hi Kim, I'm glad you had a great Christmas with your family. Thanks for hosting. Thanks for hosting, Kim! Little children in the house certainly does make for a wonderful Christmas, but that quiet calm afterward is pretty nice, too! Sounds like you had a wonderful Christmas Kim!! Thanks so much for hosting!!! Thanks so much for hosting, even at this busy busy time! Beautiful features as always! Your Christmas must have been a joyous one! Glad you had a nice family Christmas, Kim! Busy times! Thanks so much for hosting! I sure do enjoy seeing everyone's treasures. It's so nice to be off work so I can spend some time visiting other's blogs. Thanks for hosting. Thanks so much for hosting. Love all the pretty features! You selected some lovely features! Thanks for hosting the party. I am off to visit some of the other links. Thank you for hosting, Dear Kim! I do not know how you do it all! Hi Kim! Your home was so warm and inviting! Thank you for hosting a party. Our Holidays were wonderful too. Happy New Year!